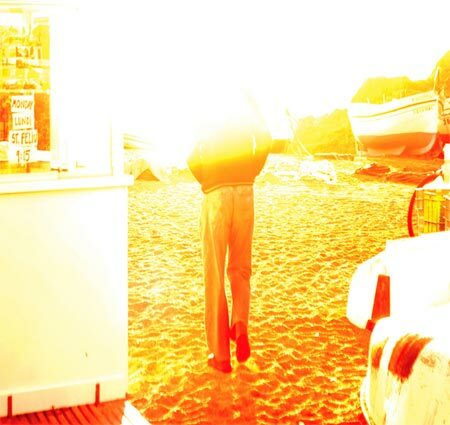 The quite bizarre soundscape artist that is Rick Senley released an album in 2011 under the pseudonym of “I Am A Man With A St Tropez Tan”. The album called “Just A Ghost” is almost like an audio painting of the world seen around you. Opening with the short distorted introduction of “In France You Can’t Call your Pig Napoleon” you’re given quick flashes of what will be coming up before the electronica heavy “Please Be Careful What You Do With Yourself” bleeds onto the speaker. Encompassing sirens, barely audible humming bass and phased to the heavens keyboard stabs the track goes out of its way to be as in-cohesive as possible, almost to disorient you. It sounds like a musical beat heart factory churning in the centre of London. “Breaking” doesn’t cut any slack either mumbling twisted announcements and breathes warp around empty phone beeps and whaling guitars. It reminds me of something from Akira Yamaoka’s earlier Silent Hill soundtracks and from the Demento Soundtrack. Eerie and devilish – especially at the end when everything pitch bends downwards. “Just A Ghost” the title track is the first track to resemble something of a normal song structure with a guitar riff and some intermittent drums and the guitar is seriously rocking out – even though it’s mostly the only instrument playing! Rick’s monologues in the middle again aren’t singing, they spoken thoughts and feelings. You know that when this is the closest to an entry point for someone, you’ve got a completely experimental album! “Tea For Me” reminds me of Bjork’s “Drawing Restraint 9” soundtrack in that its a pulsating speedy bell led track that gradually grows and grows into a furious frenzy. It really squeezes every drop of note spectrum out as it rises and distorts yet builds its tension and anticipation for a huge climax that doesn’t come. It is by far my favourite piece on the album and is a massive stand out. Melodic heaven. “Southend” follows. It’s wet. It’s full of lapping water samples and crowd noise as it lays the foundations for the more celestial “Knives of Death” that runs some beautiful synths against a churning buzzing shaker. It’s not quite beautiful enough to feel at piece. It’s certainly not prickly enough to feel discomforted. It hits a really strange balance of the two which is fascinating. “Matt, Matt, Matt” the sheds the beauty and turns into an industrial pulse of static and low-fi explosives. It pulses away before some twisted evil screams, cries and noises are thrown in to confuse you. “Does Anyone Know What’s Going On” has a singular hum that fades in and out whilst various sample clips and loops burst in and out. Some are haunting. Some are confusing. Some are damn right creepy. In a similar fashion “There Is No Death” follows sample and vibrating guitars and harsh drum loops It’s like you’re flying through the white light into a tunnel that goes ever onwards. “Just A Ghost” is as experimental and Avant Garde as you can find. Rarely do I find it difficult to recommend or describe something but this album is like taking a spiritual journey on a broken sound stage. Everything has gone to pot and you’ve just got to ride it out. There’s moments of beauty, craze, insight and skin crawl. You just have to open minded enough to give it a go.